Where the hell has this weekend gone it's another Sunday evening with the depressing thought of being back at work tomorrow, great. It's all well and good forward planning the outfits but I don't have a tent, wellies or a sleeping bag. They all got ruined at the last festival I went to! At least I got my priorities right though eh. Hope everyone's Mondays go ok anyway. I want this dress to wear as a cardi. Gorgeous! Gorgeous....loving how you have used a dress aa a cardi! I need to do me som thrift shopping! love the dress and how you've styled it a bit differently! Love how you've worn the dress, it looks so good! Love it, you look awesome! Love the sunnies and dress!! rad fit, love how you styled all the items together. amazing style and blog, would love it if we could keep in touch and perhaps follow each other on GFC and Bloglovin'? please feel free to check out my blog and let me know if you'd like to. Love your shorts and jewelry! You look amazing! 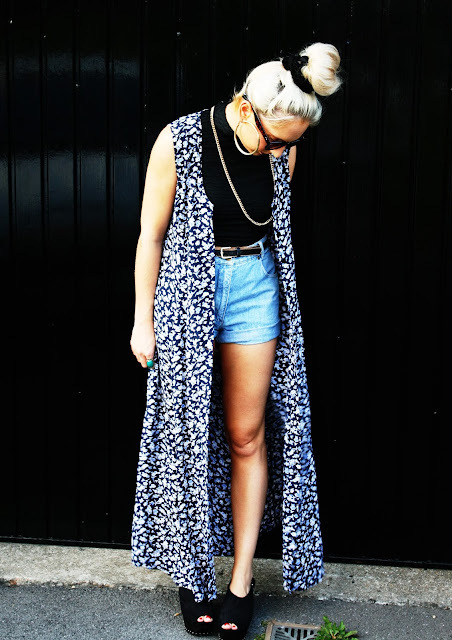 This is such a great way of wearing the maxi. really well styled.